According to the t-shirt, the first Reclaim Love / One In Love / Operation Infinite Love street party organised by Venus CuMara took place in 2003, but that year I was in hospital waiting for an operation after a heart attack and unable to pay much attention to what was happening on the streets. but I don’t think there was a Reclaim Love event in London that year. The Wikipedia entry on the event (which mentions my site and includes several quotations from it both first and secondhand) doesn’t give a clear account of the history, nor is their one on the Reclaim Love site. 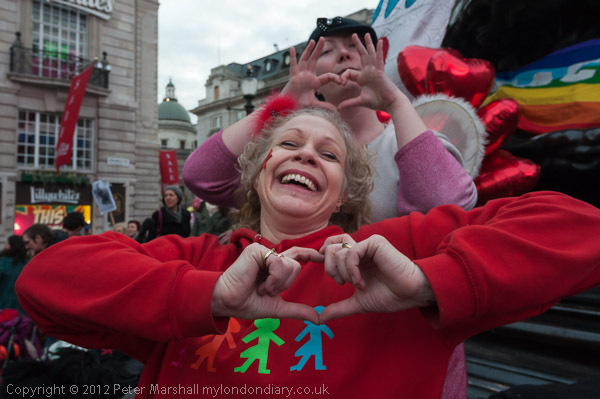 The first event that I attended – and photographed was in Piccadilly Circus in Feb 2005 and appears to have been the second ‘annual’ event, and that in the following year, 2006, was Reclaim Love 3. Other than that first occasion, I’ve attended every year since, and you can read my accounts and see the pictures for 2007, 2008, 2009, 2010, 2011 and 2012 on My London Diary. This year, 2013, my ninth set of pictures was of the 10th anniversary event, and probably the last that Venus CuMara, who founded the event, will personally organise. The central point of each year’s celebrations takes place at exactly the same time – 3.30 GMT – at the sites around the world (in 2010 there were around 40) which take part in the event. The words repeated, from an ancient Sanskrit prayer, are “May All The Beings in All The Worlds Be Happy and At Peace” and you can read more about the event on the Reclaim Love site. Whatever we think of it, the circle of several hundred with joined hands and minds is quite a powerfully moving event. Everyone present, except for a few photographers, linked hands in a great circle joining the 13 trees and repeated together “May All The Beings In All The Worlds Be Happy And At Peace” for around five minutes, and then, still carefully avoiding the growing daffodils, began to party and dance in the centre of the tree circle. At this point, two vans full of police drove up, and Venus rushed across to talk to them. 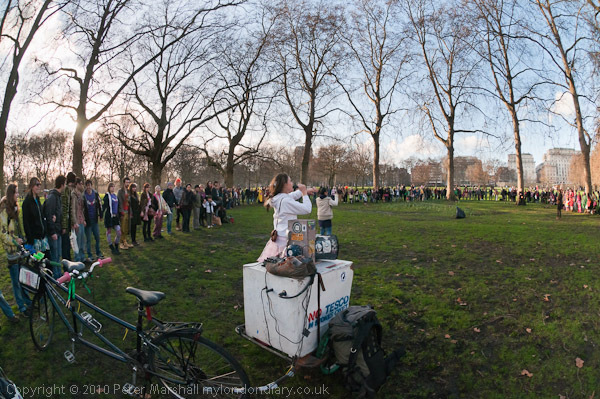 Apparently the event was contravening a number of the by-laws of the Royal Parks, and it did not have the permissions needed. After Venus had talked to one of the officers for some time, explaining what they were doing and inviting them to join in, she gave him a hug (a picture I missed as I’d moved away to talk to a friend) and they eventually came to an agreement that the group would move out of the park by 4pm and make its way back to continue the party at Piccadilly Circus – exactly in fact as had been intended. As Venus walked away, treading carefully between the daffodils, the police turned towards their van and the officer who had been talking with Venus said to his colleagues: “I really thought I was in a parallel universe there” and indeed he had been. 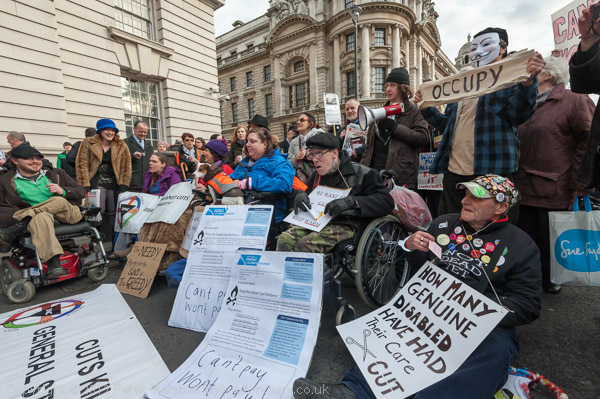 This isn’t the greatest picture I’ve ever taken, but it shows an interesting moment in the protest by the Disabled Peoples Direct Action Network at the end of the Fuel Poverty Action rally in Whitehall. The text about both actions is at Fuel Poverty Rally & DAN Roadblock. Earlier in the day I’d missed an attack on a photographer by a group of those marching with the South-East Alliance, but this time I was wide awake when others had failed to notice the start of the move by protesters to block Whitehall, as the small group of wheelchair protesters had moved quietly a few yards along the road and the woman closest to me had just eased two wheels of her chair onto the road. At the back of the picture are the police, seemingly quite oblivious to what is happening, with a Forward Intelligence Unit looking rather backward. Closer to the action, but in a small group talking to each other rather than alert to what was happening are three photographers – and there were others around mainly equally oblivious. Had the other photographers been close enough for me to reach out and touch to alert them to what was happening I would have done so, but it was important to me not to do anything that would interfere with the action that was proceeding – my job was to report it. I moved in front of the protesters as they moved out into the road and stopped the traffic, keeping slightly out of the way so that it really was them stopping the traffic and not me. We had all been given a hint in advance that some kind of direct action would be taking place, but hadn’t known exactly what, where or when. I’d been watching carefully for hints, clues or signals and had spotted and read them more or less correctly and was in the right place at the right time. There are times – and this is one – where you need to try and read situations rather than simply respond to them, though at times I have read them in a disastrously wrong way. Where there is a choice I seldom want to work with groups or speakers head on. It’s usually better to be a little to one side, particularly if people are using microphones. So when the road was blocked, I moved a little to one side, while the main crush of photographers was directly in front. Looking from the side concentrates your view on those closest to you, while a head on view leaves everyone at the same distance and thus scale. Later I went further to the side and was then able to move in close without blocking the view of other photographers when an officer came to talk to two people he had identified as leaders of the protest – one was holding a megaphone. Even when I moved around to the other side to get a better view of the exchange it was the officer rather than me who was blocking the other photographers. But then I had to move back to allow another wheelchair user came up to join in the conversation. After taking a few more pictures the officer moved and I then felt that I was perhaps getting a little in the way of others. I went down on my knees top take a few pictures from a low angle and be less in the way before moving back a little. Once I’d got the pictures I wanted it gave others a chance to get theirs. Of course we all get in each other’s way from time to time, and, like the photographer in the image above, we get in each other’s pictures. It’s inevitable when more than one or two photographers are covering an event. 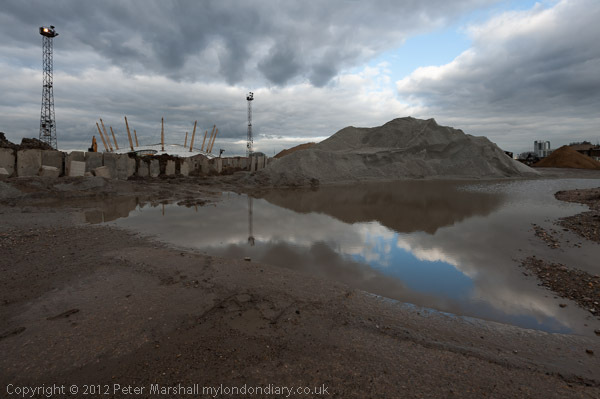 But most of us realise the problem and try to work in cooperation with other photographers. It’s mainly the amateurs, often using their phones who walk in front of other photographers, though a special place in hell is reserved for those few video crews who think they are more important than the rest of us because they work for one of the big media companies. 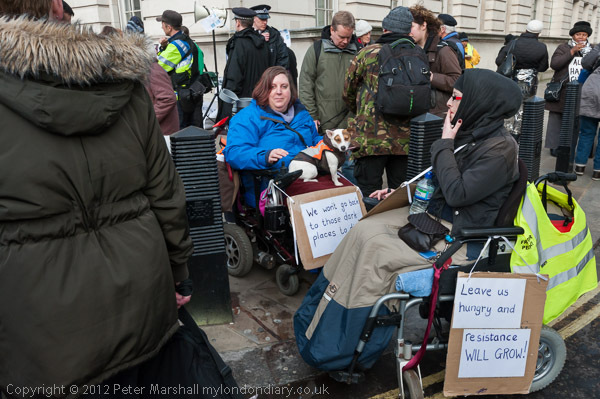 More pictures at Fuel Poverty Rally & DAN Roadblock. There are some events I cover where I have little in common with those taking part, and the ‘Defend the Flag’ march organised by the ‘South East Alliance’ (SEA) was one of these. 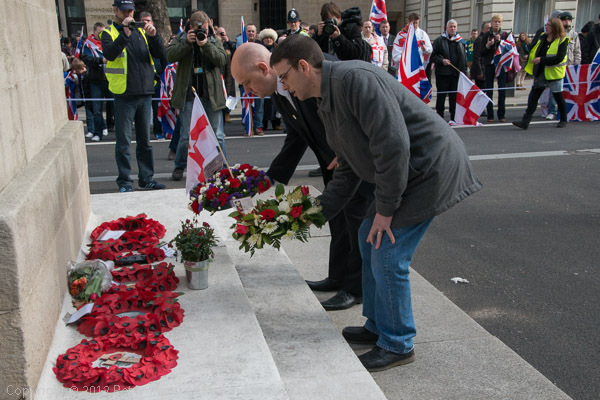 The SEA is a group that has emerged from various people who have become dissatisfied with the EDL, where there has been a considerable amount of falling out over the activities of a few of the leaders, particularly ‘Tommy Robinson’, particularly since some spectacular failures such as the march at Walthamstow last September. 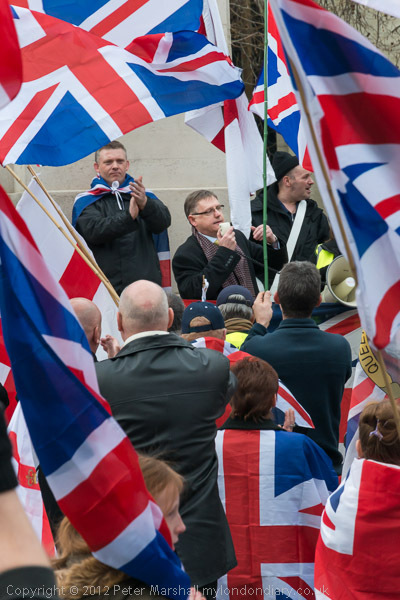 Many others in the various ‘patriotic’ or right-wing movements have long expressed dissatisfaction with the EDL for various reasons both personally to me and in the various right-wing forums on the web, and I’ve reported some of these when covering events on My London Diary. I’ve always tried to cover events in a fair and unbiased way, to show clearly what happened at them, and to convey the views of those taking part. Partly because I think it the duty of a journalist, but also because I think it is the most effective way to expose extremist views for what they are. It doesn’t mean not making my own views clear, but I try to separate these from the accurate reporting. 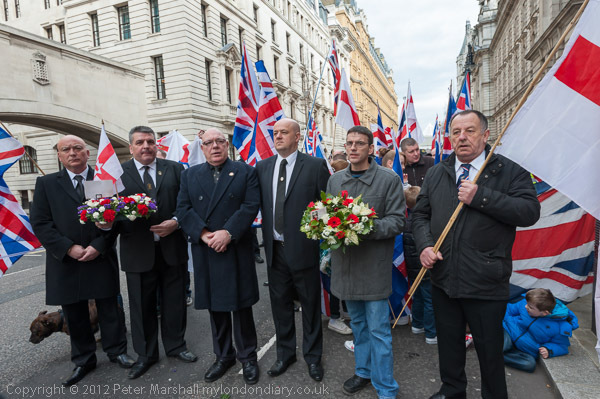 At this march, I noticed that as well as those taking part from organisations linked to Northern Ireland, including men wearing the tie or badge of the Somme Association , there were also several wearing British National Party ties and badges. 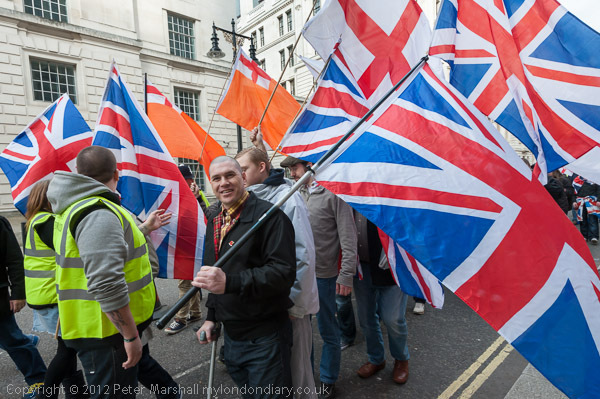 This isn’t something I’ve previously noted at recent right-wing marches (where dress has tended to be more informal) and I mentioned both in my account and the captions to photographs – as you can see in Defend the Union Flag on My London Diary. This upset another of the BNP badge and tie wearers enough to make him complain to the agency that originally carried my pictures for the event. Of course there were no grounds for any complaint. If you protest on the streets you do so in the hope of getting publicity for the cause you are supporting and are encouraging people to report on your actions and publish photographs of them, and you can certainly have no expectation of privacy. If you don’t want people to know you are a member of the BNP then don’t wear the badge or tie. Along with the other photographers I had been asked by one of the organisers to keep out of the actual march, and although I felt it was an unreasonable request I didn’t make an issue of it. There were just one or two pictures that I could only take from inside the march, and I went in briefly and did so without problems, but the rest of the time I worked from one or other side. To me the march and the rally which followed appeared to be a peaceful and reasonably well-ordered event. 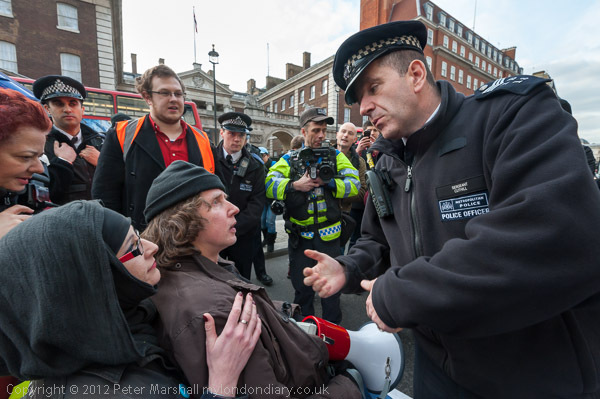 Unlike at some previous right-wing events I didn’t get abused, threatened or spat at by anyone, though there were a few personal comments but the worst thing I was called was a ‘commie photographer’ who worked for ‘Searchlight’. I’m a socialist who has never belonged to any of various communist parties around and never worked for Searchlight, but don’t take being accused of either as an insult, just a symptom of the paranoia some on the extreme right suffer from. And if Searchlight would pay the agency they could use my work just as the Guardian, Sunday Times, Jewish Chronicle and other publications around the world have done. So far the only sale I’m aware of for any of my pictures from this not very newsworthy event has been in Brazil. Later I learnt from other photographers that my impression of the march as peaceful was not entirely true. While I was photographing the front of the march opposite Parliament, just down Parliament St a hundred yards of so away, a small group of marchers threatened several photographers and attacked one of them. It’s always a problem that you can’t be everywhere and can’t see or photograph everything, even at a relatively small event like this, with a little over a hundred people taking part. I hadn’t had an opportunity to talk to the other photographers about it as I’d rushed away shortly before the event was due to finish to another event. But once I knew I posted a correction to the story. I’m unhappy with any group that tries to annex one of our national flags for its own purposes – whether in Northern Ireland or in the rest of the United Kingdom. It seems to me that a national flag should be something that unites a nation rather than divides it. It should be a national flag and not a tribal or factional one. And of course our national flag is the Union Flag. I was no fan of the Olympics, but it was good to see it being proudly carried by teams which reflected the great wealth of diversity in our country. There was a certain irony too, when watching the solemn laying of wreaths by the representatives of the Somme Association at the Cenotaph commemorating the brave Ulster men who died fighting for their country to think that this monument, designed to commemorate the military dead of the First World War from all across the British Empire, was unveiled for a second time in 1946 to remember those who died in the war against fascism to know that among those watching in the march behind the barriers were those who belong or have belonged to fascist organisations. I’ve written several times over the years admiring the powerful black and white images of Magnum’s Paolo Pellegrin, and wasn’t surprised to find one of his stories, on an area called ‘The Crescent‘ in Rochester, USA awarded second prize in the recently announced 2013 World Press Photo. 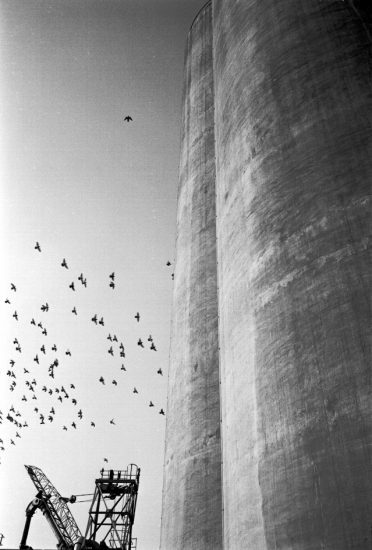 So it came as a shock to read in EPUK News that one of the images included in this was not quite what the photographer had alleged it to be, and that a large section of the text of the story had been taken almost without alteration from a New York Times story published ten years earlier. EPUK News linked to a feature When Reality Isnt Dramatic Enough: Misrepresentation in a World Press and Picture of the Year Winning Photo by Michael Shaw, the publisher of the BagNews Notes web site, which gives full details of how and where the picture was made and the various errors in the caption and use of the image – including some comments by the subject of the photograph, Shane Keller. Briefly, the picture was taken after Pellegrin had asked a student who was assisting him during the Magnum project in Rochester if he could find someone to be photographed holding a gun. It wasn’t taken in the Crescent area, and the man holding the gun was a student with no connection with violence or drug-dealing in the area. Nor, as the caption asserted, had Keller been a Marine Corps sniper – and the gun in the picture is not – as stated – a rifle! And although the man in the picture offered the photographer his details for captioning, the photographer wasn’t interested – which would appear to imply that he had already decided that the picture was going to be used in a way that did not reflect what it actually showed. The title of the BagNews Notes article suggests that it was the pressure to make stories more dramatic – particularly for the prize contests – which led him to decide he needed a picture that went beyond what reality provided and to set this up. The article publishes the material from the New York Times together with that submitted by Pellegrin, and the two are essentially identical. It seems a clear case of copyright infringement let alone plagiarism, and taken with the misuse of the image, it makes clear that what otherwise might have been arguably (if hard to believe) simply a matter of a careless approach to facts and journalistic ethics was a matter of deliberate pre-meditated deception. Not only is it a serious offence by the photographer concerned but it casts doubt on the whole integrity of the Magnum Agency. Most surprisingly, the same story also won a second place in the Pictures of the Year International Awards, with the particular picture concerned winning first place in the Freelance/Agency category, but the controversy over it did not come into the open following this. The case seems clear, and certainly demands investigation by Magnum, World Press Photo and POYi. Unless they take appropriate action they too will be sullied by the photographer’s failure, and public confidence in photojournalism and documentary photography will be further eroded. I’ve never been a great believer in ‘awards’ whether in photography or other areas. It’s always seemed to me that the real award for making a fine image or a great film is intrinsic in the thing itself, and certainly the kind of awards ceremonies for the Oscars and similar events are both embarrassing in the extreme and actually demean all those involved – whether they win or not. Few of the greatest films have done well at the Oscars, and if the satisfaction of making great works isn’t in itself enough, you probably are not making great works. 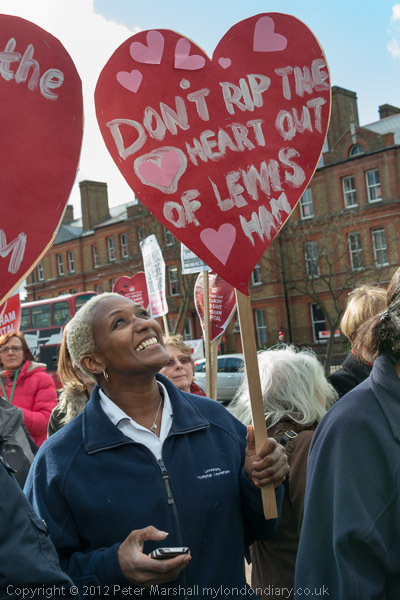 The government has decided to sacrifice Lewisham Hospital as a token gesture over NHS costs, although it seems likely that the costs of closing it will in the longer term be greater than the short-term profit. Lewisham is a successful hospital clinically and financially, and serves a large population in south-east London and it is hardly surprising that the closure plan – removing its essential A&E and Maternity services along with some other children’s services – has caused local outrage, with many thousands on the streets for two major demonstrations – see Save A&E at Lewisham Hospital and Save Lewisham Hospital – as well as many smaller events. The losses of the local heath area are nothing to do with Lewisham, but arise from the decision to use private finance to build hospitals in neighbouring areas. 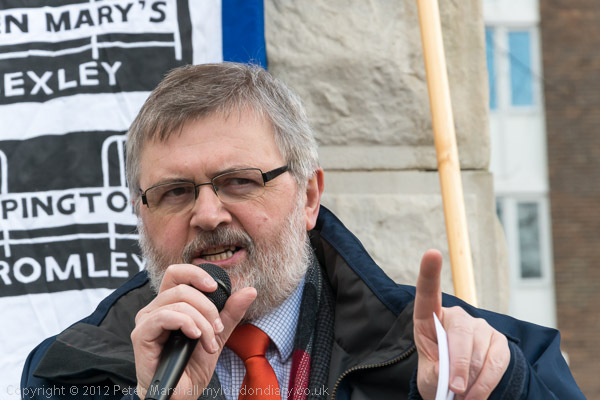 The contracts negotiated under PFI reflected the lack of commercial nous in the public sectore, exacerbating what was in any case a disastrous policy, and now the pigeons hatched in Woolwich are coming to roost in Lewisham, at a time when government policy is rapidly privatising our National Health Service. Around 150 people came to a lunchtime rally at the War Memorial opposite the hospital, where there were short speeches by a large number of people. I scrabbled around in my pocket for my notebook to record their names, only the remember that I had taken it out to write up a protest a couple of days earlier and had left it next to my computer at home. The only paper I had to hand was the small A6 rectangle of scrap paper I’d used to write down my directions for the day – times and places of events, bus numbers etc. I’d written these on the back of a piece of an old letter, and had covered most of the blank side with my pencilled directions. I had to write the names of the roughly 20 speakers over these in biro. Even when I remember my notebook, writing while taking pictures isn’t too easy. It would be rather easier and a better solution to be able to attach short audio notes to pictures – as you can on some phones. I do carry a small audio recorder, but it’s too fiddly just to record the odd note, and slow to have to look at the frame numbers on the camera back to use them in the recordings. Sometimes I do record longer audio tracks , but then having to search through and hour of audio to find the names takes too long. You can add audio notes to images on some cameras – and with software on camera phones – but not on the Nikons. Theoretically I can use the buttons on the back to add a message, but it takes ages – and I type in one a year as a copyright message. Taking the pictures of the crowd gave me the opportunity to include the older hospital building in the background, but for some of the best opportunities this also meant pointing my camera directly towards the sun. Being Winter, the sun even in the middle of the day was low, so hard to avoid even using a moderately wide angle. I think even the manuals that come with Nikon’s professional cameras tell you to take pictures with the sun behind you, but of course this is neither always possible or desirable, and I like working towards the sun. It used to be considered a specialised aspect of photography, contre-jour, but hardly now qualifies as anything out of the ordinary. 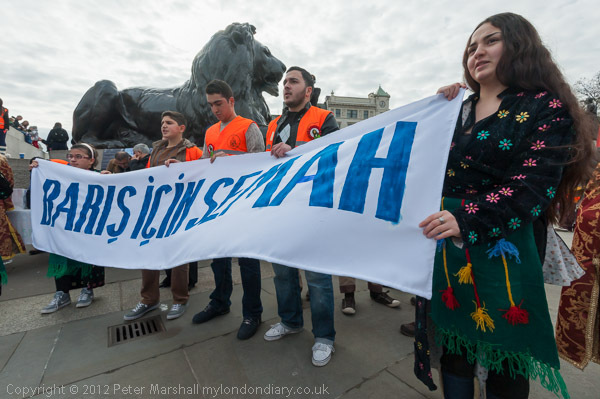 In several of the pictures I was able to make use of the placards that the protesters were holding up as lighting ‘flags’, thus avoiding excessive flare and ghosts, and for some pictures other protesters served the same function. Digital makes this kind of thing easier, first because you can see immediately if you have got the results but also because it makes the post processing simple – just a quick dash with the adjustment brush in Lightroom to add a little brightness and contrast to the faces and other significant areas in shadow. The problem with using people as ‘flags’ is that they will move unpredictably while you are taking pictures. Just as I don’t normally direct the people I’m photographing, I don’t direct those I’m using to control the lighting. 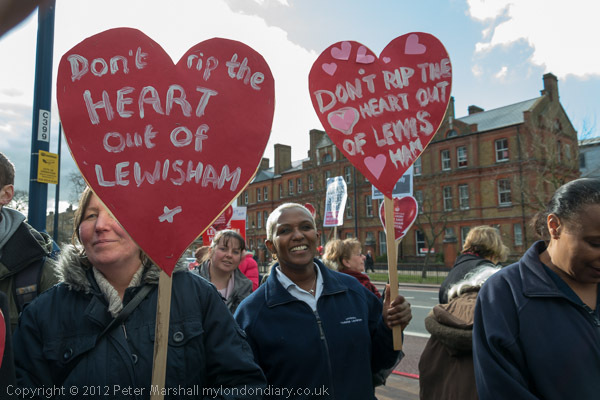 More pictures on Fight to Save Lewisham Hospital Continues. Old War Office with charcoal crosses and supporters stand in solidarity. 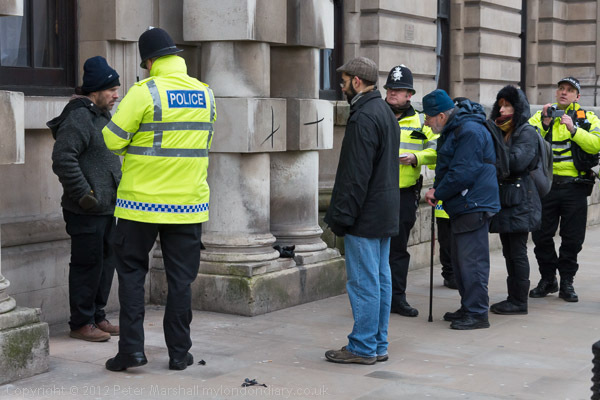 I’d arrived just minutes late to get a picture on Ash Wednesday when two Christian peace activists were being questioned by police after having scrawled charcoal crosses on the pillars of the Old War Office in Whitehall. 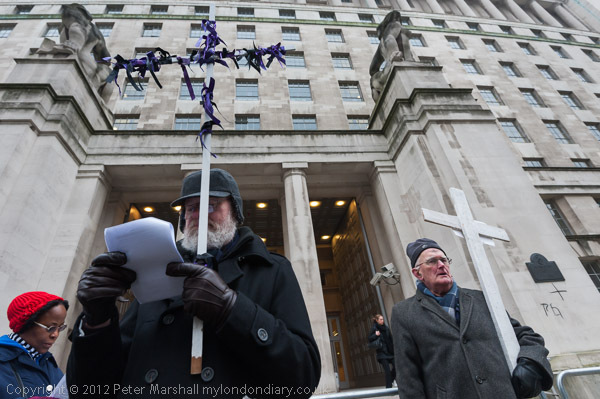 More pictures of the whole event at Ash Wednesday – Ministry of Defence. 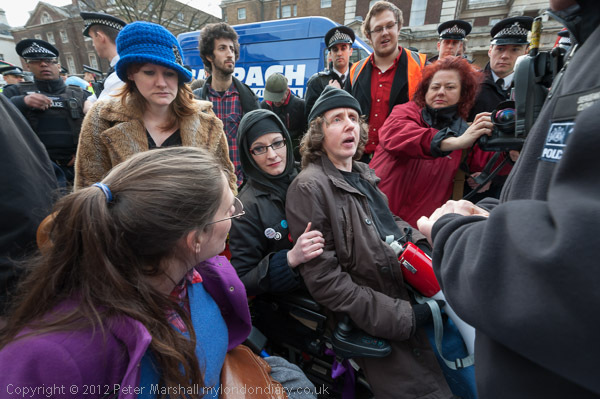 I’d come down by bus from North London, where I’d been photographing a protest Victimisation at London Met on a cold pavement outside London Metropolitan University where two employees have been suspended on very dubious grounds. After an hour standing on a cold pavement and another half hour on a bus travelling to Trafalgar Square I needed to pay a brief visit to the toilets there before rushing down Whitehall. 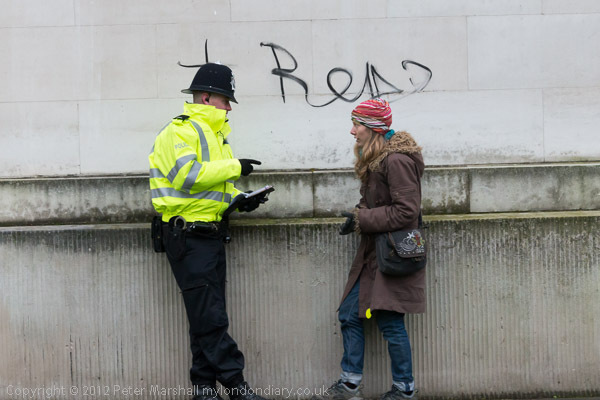 Had I not paused I might have got pictures of those writing on the wall actually being stopped by police. But more likely I would have hurried past just before it happened, on my way to the main body of worshippers at this regular Ash Wednesday event around the Ministry of Defence. It’s even possible to take pictures from the bus, though reflections in the windows are often annoying. But on many journeys buses are about as quick, and they reach places untouched by the tube, often taking you more or less to the door. And a particular advantage for me is that I have a pass that gives me free travel on the buses but not on the Underground or Overground rail. 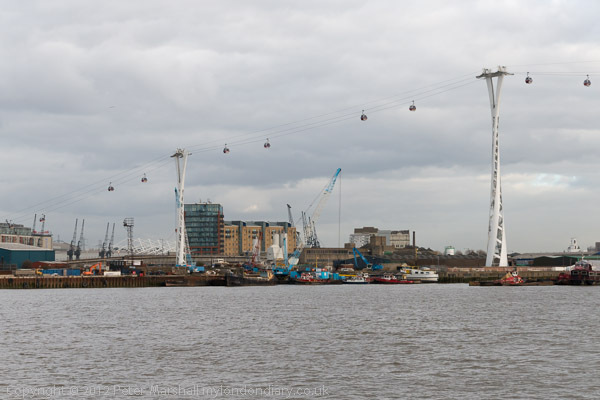 Public transport in London is relatively expensive compared to most cities around the world. 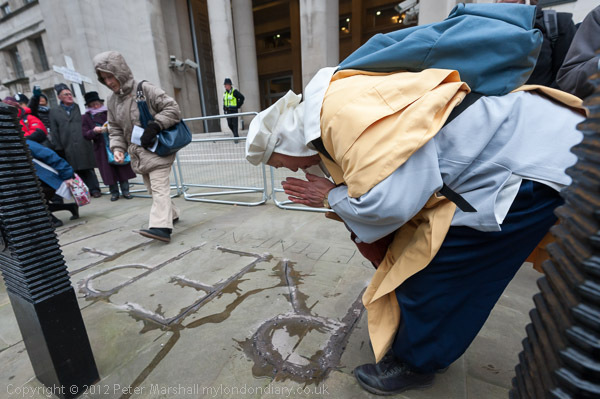 But back to Ash Wednesday, the ritual marking of the buildings is an annual ‘cat and mouse’ game between police and protesters. You know it will happen, but not exactly where and when, with around a third of a mile of wall on three streets and an hour and a half or so. There are police spaced out at intervals, spread thinly all along the walls, but large gaps allow the protesters to at least start the marking, though I don’t think this year any of them managed to complete the word ‘Repent!’ after making their crosses. Previously one protester had managed to leave his charcoal mark next to the name plate for the ministry, but it was now surrounded by barriers and police. I didn’t have a long enough lens to get a good picture, and had thought about going back on my way home as the protesters were dispersing and asking to go inside the barriers to take a picture. But I stopped to talk with a police officer a little down the road and then forgot all about it. At the very end of the protest, I missed another protester who had vaulted over the low fence and rushed across the short stretch of grass to write on the wall. She did it while my back was turned as I was photographing the final service a few yards away, and again all I could photograph was the police talking with her. They released her after a few minutes and she vaulted back over the fence to rejoin her friends. In some previous years I’d experienced just a little hostility photographing this event, being angrily reminded by one person at one point that this was an act of worship. 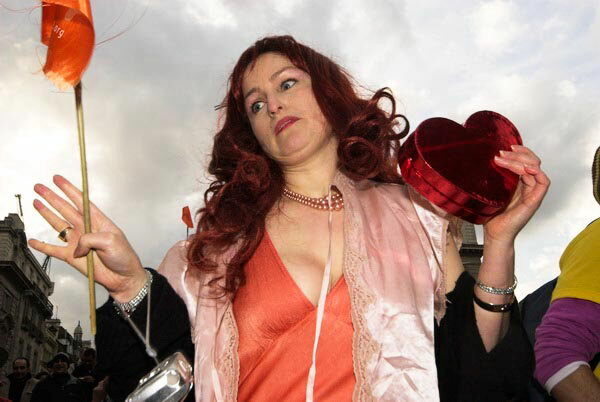 Of course I was trying hard to cover it in a suitably reverent fashion, but my actions had still upset her. A few years on, with now so many of those taking part also taking out their digital cameras and phones and taking pictures, often in a rather more intrusive way than I would have chosen, I had no such problems. Just occasionally there are advantages for photographers in everyone having a camera. 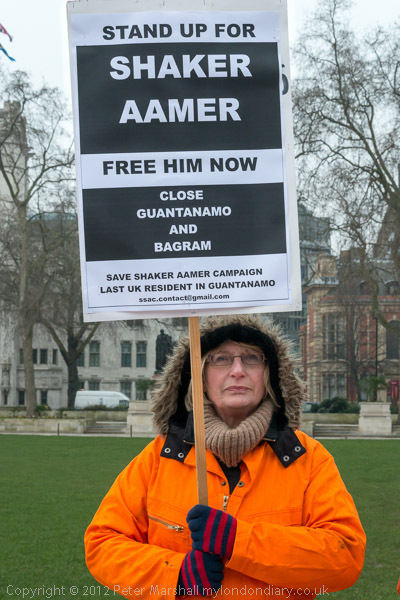 On a bitterly cold morning for London – around zero with a noticeable wind, I put on an extra layer and went to photograph in Parliament Square, where around 20 people were holding up banners facing the House of Commons, reminding MPs that London resident Shaker Aamer had been held without trial at Guantanamo for 11 years. 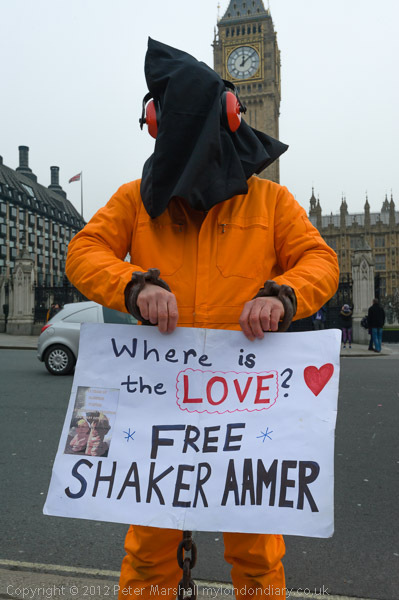 You can read more about the protest and see more pictures in Shaker Aamer – 11 Years in Guantanamo on My London Dairy. 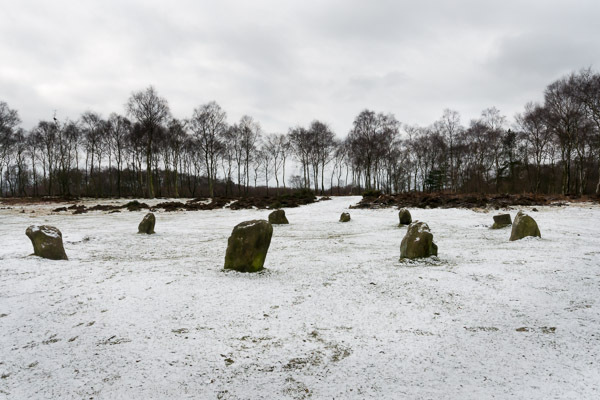 The same day we’d had an e-mail from one of my wife’s old school friends in which she’d mentioned the weather where she was living in Canada – where they were having something of a cold spell, with the temperature at 50 degrees below zero. I’m thankful not to be working there, as I was having problems keeping warm in London. Fortunately it doesn’t get cold enough here to have to worry too much about equipment, which all seems to work OK around zero. 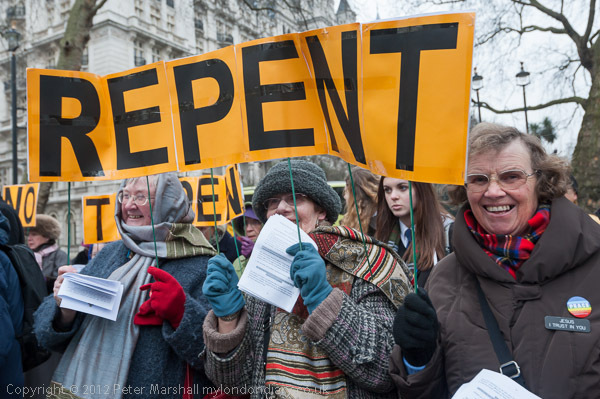 I get cold standing around, not so bad if I can keep walking, but I felt for these guys standing holding banners and placards in orange jump-suits, not as warm as the fleece and jacket I was wearing – and black hoods are not as warm or wind-proof as my Polartec hat. Some weren’t even wearing gloves, and I can’t work in cold weather without them, though I can’t find anything really very warm that still lets me work a camera without problems. My current solution is a pair of thin silk gloves with a second pair of close-knit wool gloves on top, reasonably warm and I can do almost everything with both pairs on; for anything really fiddly I can take off the wool, and the silk still keeps my fingers a bit warmer. Silk gloves on their own are good for when it isn’t too cold, but it doesn’t take long for the shutter release and other controls to make a holes in the tip of the finger. The wool is a bit tougher, though I’ve already got through one pair this winter. Apart from keeping warm – and at least unlike the protesters I could walk around a bit – I had two main problems. The first is that I’ve photographed so many protests with people in orange suits that it’s hard to find anything new to say, and the second is with the way that the camera reacts to saturated orange and red. Even in this small reproduction I think it is clear that there is something wrong with the orange, while the rest of the image looks about correct. Cutting down the saturation would help a little, but the better solution I’ve found in the past is to use an ‘untwisted’ camera profile in Lightroom (or Adobe Raw.) And I do that with images from the D700, such as the picture below. I think the difference is clear, though you can’t assume that the two orange suits were equally intense, there really was quite a range. The lower image was taken on the D700 for which I have ‘untwisted’ profiles which I downloaded several years ago, but I can’t find any for the D800E (there are some on line for the D800, but I can’t get Lightroom to use these.) I’ve tried downloading software that untwists the standard profiles (created because the free Adobe profile editor doesn’t), and it runs to create new profiles, but again I can’t get these to show up in Lightroom. Having wasted and hour or two I gave up trying to make my own profiles – but if anyone has succeeded for the Nikon D800E I’d like to have copies. But there is still something that Lightroom can do. In the Camera Calibration panel of the Develop module there are hue and saturation sliders for the Shadows and Red, Green and Blue Primaries. Here is the result of setting the Red saturation to -20 on the top image. On my screen the improvement is very marked. I think there are other small improvements from choosing the Camera Portrait rather than the normal Adobe Standard profile, and also perhaps a very slight tweak of the Red Primary hue. For this image, the shadows, such as they are, are generally fine, but having discovered the Shadow slider which shifts along a green – magenta scale, I think I may have a solution to a problem I found working in mixed lighting a couple of days later. Future versions of Lightroom may well omit these controls as Adobe people have stated that the job can be done better by using specific profiles. But for the moment they are still there even if we seldom need them. I’d rather be out making pictures than having to fiddle so much with them. 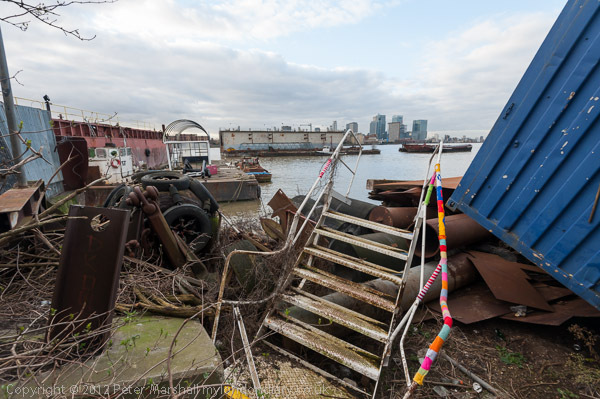 You are currently browsing the Re-photo blog archives for February, 2013.